Purifying water couldn't be easier! 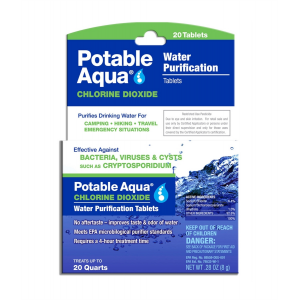 Simply drop a Potable Aqua chlorine dioxide tablet from this package of 20 into a quart of water and let it go to work. 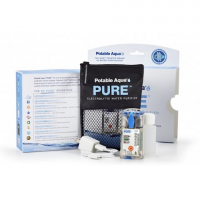 Purifying water couldn't be easier! Simply drop a Potable Aqua chlorine dioxide tablet from this packet of 30 into a quart of water and let it go to work. Potable Aqua Drinking Water Germicidal Tablets are iodine based tablets that works on all bacteriologically impure water. One bottle contains 50 tablets and will purify 25 to 50 quarts of water, depending on source of water. Potable Aqua iodine tablets kill bacteria, viruses and giardia while taste-neutralizing tablets help rid treated water of the iodine taste. 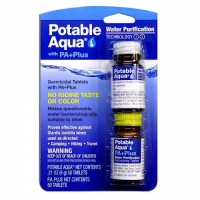 Potable Aqua iodine tablets are a lightweight and economical way to make water suitable for drinking. 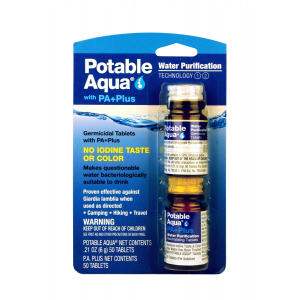 Potable Aqua Tablets provide purified drinking water from any fresh water source. PA Plus tablets remove iodine taste and color.